Today’s electronics are demanding tighter and tighter tolerances, and the assembly of many items require holding precise spacing between parts during assembly. The spherical shape and precise sizes available make microspheres the ideal candidate as a precision spacer in various liquid adhesives and epoxies. 1) The actual bond line will correspond to the largest spheres, not the average size. Narrow size ranges of a few micron ensure the proper gap is maintained. 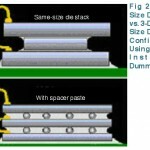 If a 30um gap is required use a spacer grade size range of 27-30 micron. If a 40um gap is required use a spacer grade size range of 37-40 micron. If a 53um gap is required use a spacer grade size range of 50-53 micron. 3) Functionality gained from using different materials. Glass offers the best mechanical and chemical stability at a wide range of temperatures. Plastic such as PMMA can be used where some deformation is desirable. Metal coated glass spheres can be used where conductivity is desirable. Hollow Glass spheres can be used where assembly pressures are low, and reduced thermal conductivity is desired, available as uncoated hollow glass or silver coated hollow glass spheres. A mixture of about 5% by volume should work for most applications. Low crush strength spheres will require higher loadings. Proper dispersion in the adhesive will help to minimize the loading needed. High viscosity epoxies will help maintain sphere dispersion. For best results choose an adhesive that adheres to the spheres and the base material. Long pot-life materials work best, as they allow excess adhesive to flow out of the bond line during assembly. 6) Spacer Availability – Cospheric LLC stocks a wide variety of sizes and materials, and can custom produce spacer grade microspheres for your application. Spacer Grade Glass Microspheres are presently used in gas plasma displays, automotive mirrors, electronic displays, flip chip technology, filters, sporting goods equipment, calibration standards and transformer manufacturing. Every day engineers are finding new and innovative uses for bond line spacers. One area that has had the most publications is in die attachment in the semi-conductor industry, a particularly interesting area is in using spacers for building multi-die packages. “Upon close examination, it was noticed that the die with a large amount of tilt showed a significant absence of spacers. These early experiments concluded that it was possible to have too few spacers under a given die. The next logical step was to determine the effect of too many spacers. 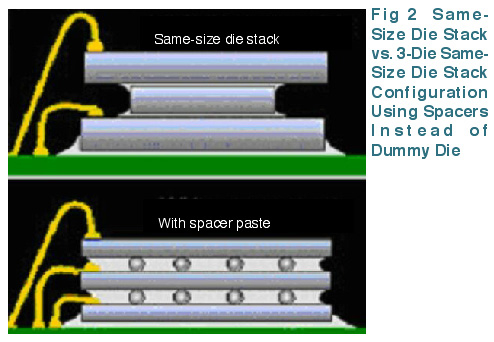 A Ag-filled paste was filled with 1-mil (25.4micron) spacers to a volume percent loading of 3%. This experiment concluded that there was a 25% loss of die shear strength as a result of the high spacer loading percentage. Proper dispersion in the epoxy helps to minimize the loading needed.